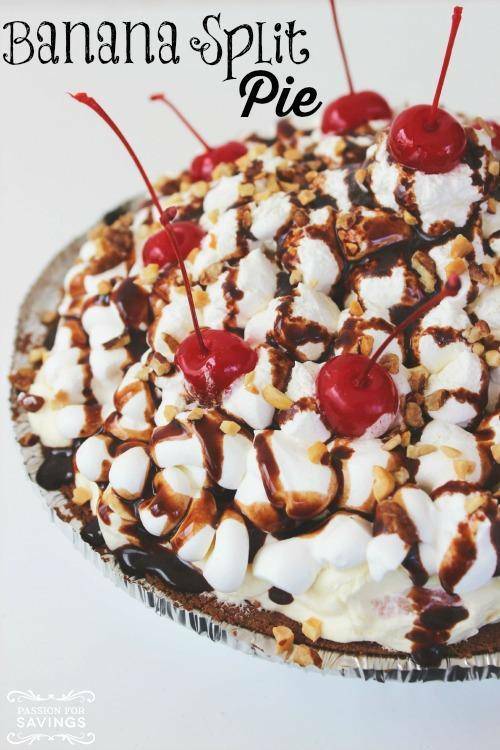 Easy Banana Split Pie Recipe! Home / Savings Blog Posts / Recipes / Easy Dessert Recipes / Easy Banana Split Pie Recipe! If you are a fan of Banana Splits, you will want to try this Easy Banana Split Pie Recipe! This Easy Banana Split Pie Recipe is perfect for any holiday or dinner party with your friends! I love this recipe for summer or after a long day of playing outside! If you are having a picnic or family reunion, this could be the perfect dessert recipe to take with you! Don’t forget about Memorial Day, 4th of July, and Labor Day! Try this Kid Friendly recipe tonight with your family! Keep in mind that you can use peanuts, pecans, or your favorite type of nuts on this recipe! If you or one of your kids is allergic to nuts, you can always leave these off! If you want to try something a little different, make your own Mini Banana Split Pies! Just use these Norpro Nonstick Mini Pie Pans from Amazon and you can serve individual Banana Split Pies! These are only $9.44 for a set of 4! Receive Free Shipping with Amazon Prime, or Free Super Saver Shipping on orders of $35 or more! Use Crumbled Oreo Cookies for your Pie Crust, or make your own! For another great recipe, be sure to check out this Southern Sweet Tea Recipe for a McAlister’s Deli Copycat Tea Recipe!